Newborns have excellent listening skills- babies are musicians! It seems a wild claim but it’s true that babies are musicians in the sense that they are highly discriminating listeners and have better music appreciation skills than many adults according to Emeritus Professor Sandra Trehub. Dr Trehub is the Director (publications) of the Infant and Child Studies Centre at the University of Toronto Mississauga. In studies where the baby sits on its mother’s lap watching a puppet show, a single speaker plays a simple melody. At random moments a single note changes in the melody. In most instances the baby will turn its head towards the speaker indicating that the subtle difference was picked up. In similar studies where changes are made in tone, key and rhythm babies recognise the differences when some adults don’t even get them. The centre has shown that babies are happiest when songs are sung to them face-to-face, even when it is just the syllable “la la”. Given the same melody to listen to, they prefer the sound of a human to the sound of an instrument (piano) and they enjoy the social interaction with the singer. Infants prefer the songs their mothers sing them to other songs. The social-emotional relationship with the mother influences what they will listen to and attend and thus strongly influences learning. 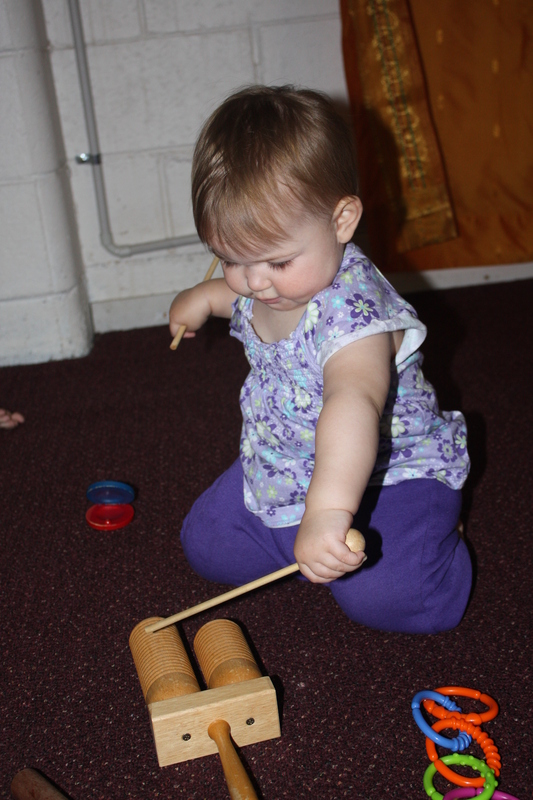 Babies are musicians making discerning choices that will determine musical preferences for a lifetime. Other research deals with children’s abilities to detect sounds in noisy backgrounds – an important ability for successful learning in classrooms. Dr. Trehub is highly influential for her work in collecting songs sung by mothers and others in the course of care-giving and explaining just how those songs regulate infant emotion. She has found this activity of singing to babies and young children to be universal and that there are two kinds of song, lullabies for soothing and play-songs for stimulating babies. She has collected samples of singing from various national and ethnic groups in order to document the similarities and differences. It seems that babies are musicians and mothers are too! If you are interested in finding out more about the work of Dr.Trehub please follow this link to the Music Development Lab in the Infant and Child Studies Centre. If you are interested doing a unit of study into what the latest research from various countries can tell us and how we can apply it in our early childhood music programs, please write and inquire about our Musical Child Training Modules. I just came from visiting my first grandchild. Both his mother and I are music teachers but it was interesting to see him prefer his father’s lower pitched singing. Infants really do have preferences. Isn’t that interesting Connie. There’s obviously a strong connection to his father’s voice which he has been hearing since the end of the first trimester in utero, albeit in a muffled way. The downside is there could be a tinge of disappointment from you or your daughter since you two are the music teachers in the family! I hope you all get enough musical playtime with the darling child to satisfy everyone. And congratulations on achieving grand-motherhood – a wondrous and important role. Thank you Carol. It is a wonderful joy! I love singing lullabies to him and helping my daughter relearn them. Its like passing on a musical torch!